Styled with monteview sweater and the slim sweatpant . 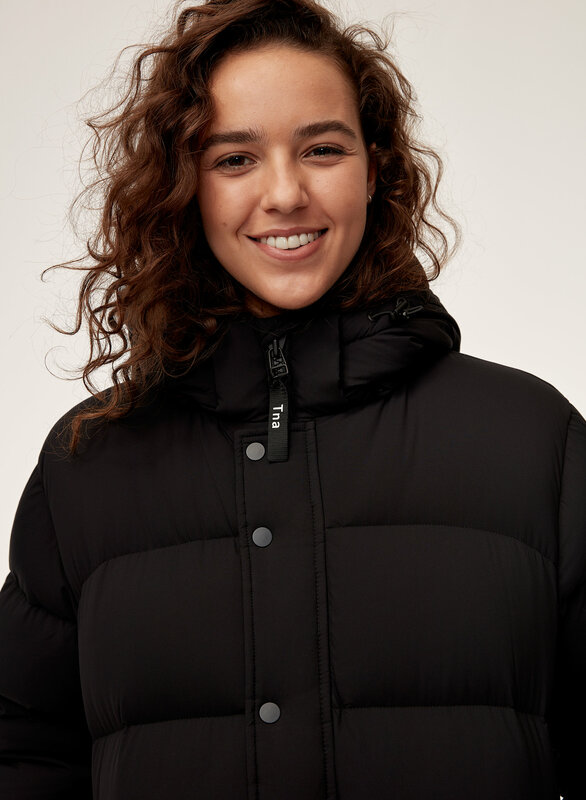 Engineered to deliver warmth to -30°C / -22°F, the Super Puff will keep you super warm where it counts. 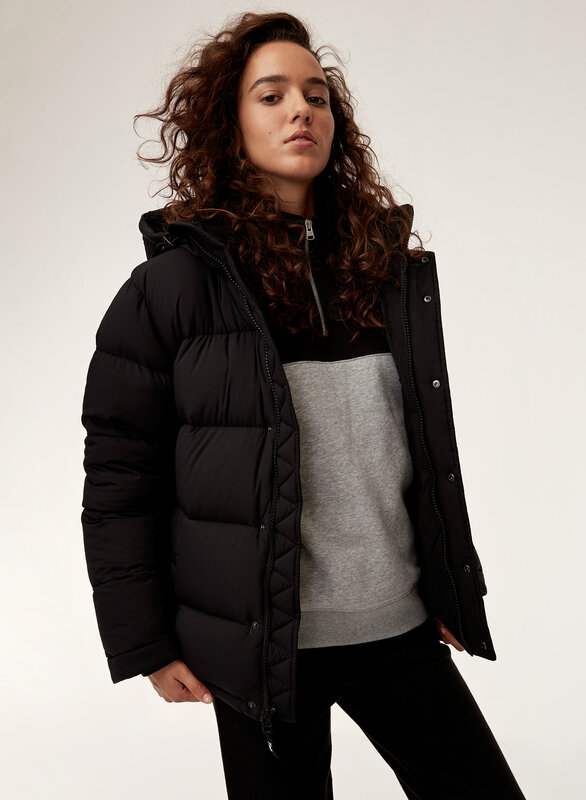 Designed with maximalist proportions, this version is made from an innovative Japanese ripstop fabric that's water repellent and gives when you move. I love this jacket! So much so that I bought a yellow a pink and a red one. I might buy a black one. It doesn’t feel heavy but it keeps you snuggley warm. You won’t be disappointed if you buy one! Love, love, love it for cold weather in the spring. I originally bought this due to the fact so many celebrities wore it. Which means to me, that since they have all the money in the world and the best stylist to dress them and they chose this jacket to wear, then it must be the best. And to be totally honest, it is. I just love it and if you haven’t seen Margot Robbie in this coat, you must. It will make you buy it as much as it made me want to get it. Overall, it’s comfrotable, a little bigger for my liking, but I’m so warm in it and it’s even perfect for chilly nights and sunny colder days. Very warm M well designed for women a lot of bells and whistle’s. What else can I say? Love it. First time I got S that was larger .I just exchanged XXS that’s perfect. Amazing quality, but down comes out. I really love how warm this jacket keeps me, but my only issue is that the down is always coming out. I got mine in red, so it’s definitely not as noticeable as if I were to have gotten black, but you should keep that in mind before buying the jacket. The fabric is very soft, & the jacket is light but is definitely meant for cold winter days. It is very warm & actually even warmer than my parkas!! Needs a better outer lining!!! This is my favourite jacket in terms of warmth so it makes me sad to write this :( The feathers come out like crazy!!!! Considering how pricey this jacket is, it should not be shedding like it does. Whenever I carry a black tote bag, the feathers shift around in the jacket and sheds all over my tote. Wouldn't be surprised if the jacket became flat within the next few months. Please fix this issue - myself, along with many other Super Puff lovers can agree this is a large issue for such an expensive jacket. Had to write a review for good karma because I had spent hours researching reviews about this coat before I bought it. It's beautiful and soooo warm! I'm completely toasty during the frigid Montreal winter I am very happy to say! Loved it at first, but not sure about the long run. Saw my friend with the mid length super puff and fell in love with the style. I went to try the short and bought it right away. It is really soft and comfortable and is now my go to coat. t's been about two months and I feel like the filling is already wearing down in the arm area where there is lots of movement and rubbing against my body. I was okay with it. However, what disappointed me was that my jacket got wet due to light showers while I was walking home and the next day the area where it got wet shrivelled up. The material doesn't seem to dry properly and it feels like the filling in those areas flattened out. The fabric, the warmth and the fit. All what I was hoping for! The description noted that it was roomy and I can wear this coat with a huge hoodie no problem! No matter how cold winter in Canada has been so far not once did I feel a chill while wearing this jacket! i bought this jacket because it looked super cute and it was very warm. however it's been 2 months now and i've noticed that the down keeps shifting and feathers are coming out from everywhere. i feel like next winter, all the down is going to be gone and the jacket will only be a piece of cloth left. it would be nice if there was a way they could help us fix this problem. I get so many compliments on my Black Shiny puffer. Keeps me so warm and is the perfect length. Also love that the sleeves are slightly longer with the soft lining. The super puff is an awesome jacket. Super warm and comfy. cute jacket but for the price, should not leak feathers. Love this coat! It is unbelievable warm. I got the black shiny one and receive compliments on it all the time. I am about 5’5-5’6, 145 lbs and the size XS fits perfect. It’s still a decently loose fit and can wear thick sweaters and hoodies underneath without feeling snug. No complaints. Great coat. I tried an S at the store and it was too true to size. I was expecting a bit of a loose feel but it wasn't. All the Ms rand out so now I am trusting myself to buy an M and see if it fits loose. The sizing can be a bit tricky, so if you're serious about sizing and fitting, make sure you TRY ON at the store FIRST. When I buy a jacket I usually buy it with the idea in mind that I'll be wearing it for a few seasons. Bought the super puff last year and loved it at first. The warmth was unbeatable for the first couple months. But after regular wear I noticed that the down in the arm was shifting to the outer portions of the arm leaving the inner arm completely down-less. Now every time I wear the jacket I can immediately feel the cold on my inner arm making the jacket less then optimal. Product Flaw. This coat is super cozy and keeps me very warm. It is also SO cute and comes in so many fun colors! The Super Puff is nothing short of ‘super.’ It is a fabulous design, featuring brilliant detailing, soft and high-tech fabric . In short, great value for a very high-end product. So warm and SO light weight! I ordered both XS and XXS and ended up keeping the XXS and it is still not tight at all and has the over sized look and i can easily fit a hoodie or sweater under it. It is so warm and amazing quality but to me the best part is that it is not even remotely heavy or feel bulky. My favourite coat! Super cute, super warm, super comfy, overall super! I love this jacket so much but I'm surprised at how big the sizes run-- I've never been an XXS in my life. 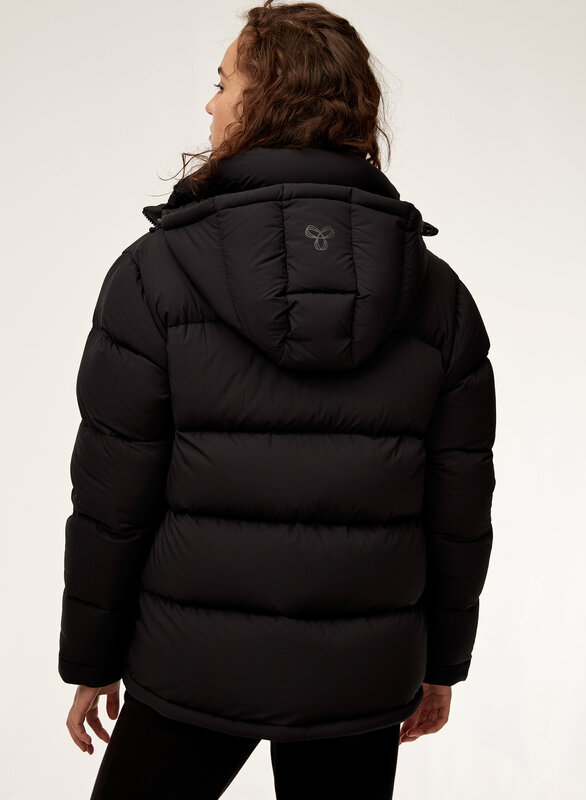 It's incredibly lightweight but at the same time because it's good at retaining heat, so warm and comfortable. Love the feel and is very warm, but it is definitely much larger than I expected. Tried to exchange to a smaller size but tags were removed. I bought this in black because it was super cute and I heard great things but right out of the box, there were feathers coming out of it from all places. While wearing it, it almost looks old/dirty because of all the feathers poking out of it that it doesn't have the polished look that you see online. 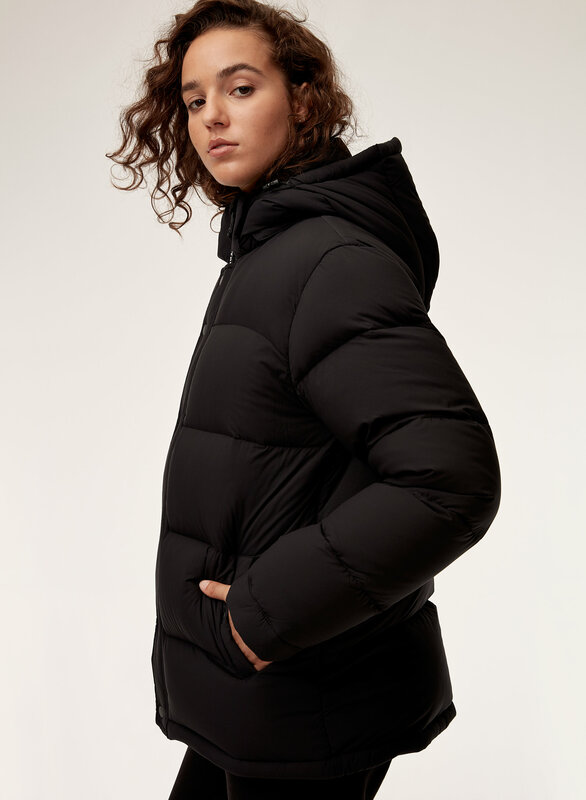 I have several coats from Aritzia and I love them but this is one I would not recommend. It is a cute jacket, and pretty warm. The Super puff is NOT good quality for sure! Size is quite bigger than usual. I got XXS. Usually I wear S or M.
Love the coat. Super warm but light at the same time. A tad bit bigger than I expected so size down (I got a small should have got an extra small). Will by more and want more. It’s warm. It’s comfy. 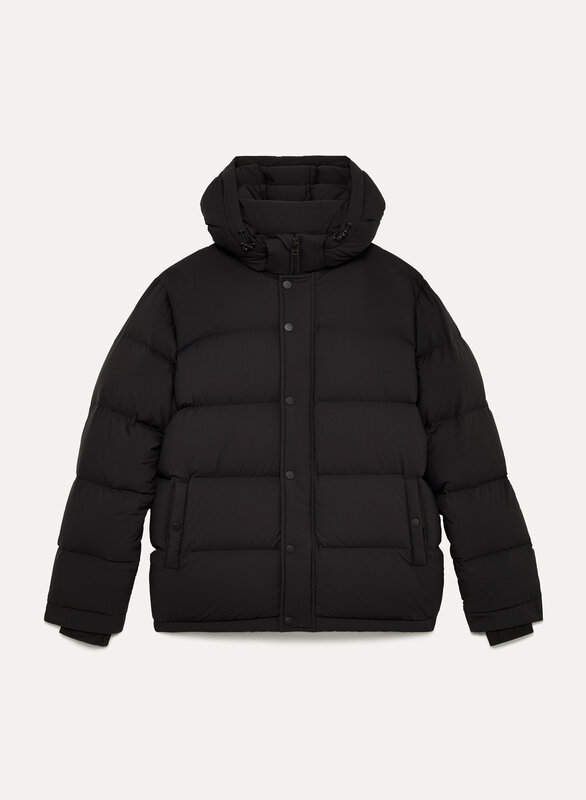 It does shed feathers more than I’d hope for the price but if that in anyway effects the longevity of the coat I’ll update my review. this jacket is obviously amazing. super cute super warm super awesome!! i love it. the only thing that kind of makes me sad is when you spend 280 on a jacket you’d expect the quality to at least guarantee that little bits of down wouldn’t be escaping from the jacket, but they do :( and this jacket is brand new lol. that stresses me out so idk if it’s a factor for any other potential buyers. i’m 5’1 n usually buy a size M at aritzia but sized down n got a S and it fits the way i wanted it to a little oversized but still snug! It’s warm. However, I could see the down came out sometimes. If the outside material is a little thicker, that will be better. I love my super puff - I purchased it for my casual runs around the city. It's surprisingly warm for how light weight it is and very, very soft. My only recommendation is to be very aware of the fact that this leaks feathers quite often due to the soft shell of the jacket. Every time I wear it, I shed and it concerns me because the more it sheds, the less warm it will be over time. However, for the price point, this jacket will definitely last me a season and I am satisfied with that. My favorite coat this season. Got the pink one and the color is pretty&bright. Warm, soft and light so good for cold days. The only thing is it is oversized, so order at least one size down from your normal size. I was debating between XXS and 3XS. Glad I went with the 3XS because it has the oversized look, yet it doesn't look enormous on me with room to layer. This jacket is so cozy and lightweight. A few details I found out in person: 1) the interior sleeves inside are skinny but stretchy 2) interior chest has unnecessary white writing that may be seen if you wear it open 3) pockets are deep 4) TNA logo is huge on the interior back 5) you can tighten the hem with toggles. So far I love it and would consider getting another color. This is one of the best winter jackets I have ever purchased. The fit & quality is amazing! It is perfectly oversized, lightweight, and gives just the right amount of warmth for Boston winters. Also, I highly recommend getting it in taupe. So so beautiful! 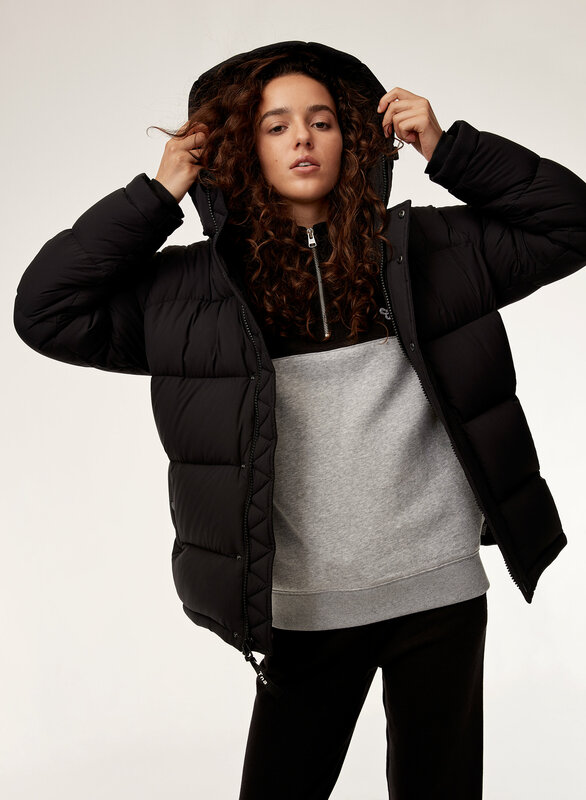 The texture of this puffer jacket is soft and supple, plus it's warm and super stylish. Perfect for early winter days. super puff review 5 stars! It's the best coat ever. It's very warm for cold canadian weather, I recommend it for everyone. Super warm but feathers keep coming out of the jacket!! Super warm and comfy! can go with any outfit and is a key piece in everyday winter wear. Does fit larger but it spices up an outfit with a chic oversized jacket look, would recommend ordering your regular size.